I'd be happy to host you one day.Just drop me an email when it warms up. 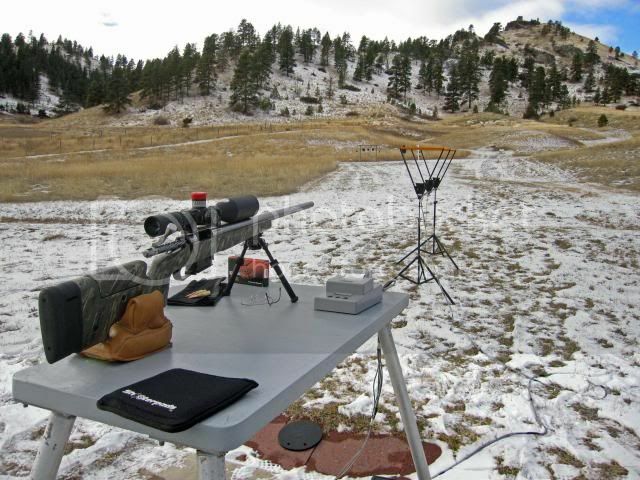 Like I mentioned the "out to 1260" steel shoots start in the Spring/Summer, but we can do the 125-675 yd range ANYTIME. Annual membership is $50 I think? Decent range, but it can be windy. Nice that we can put up portable steel, shoot clay targets on the berm, etc. Not all Ranges are so flexible. TR what are you shooting? I have access to a couple of used stocks. Looks like a great range! What's the format of your matches? Format? No idea yet. It's always been unorganized. Simply several guys shooting at the provided steel or clay targets on the berms. We have everything from Sharps rifles to a guy shooting a .408 Chey-Tac and everything imaginable...in between. AR's, hunting/varmint rifles to dedicated Tactical/benchrest rifles. This year I'm hoping to introduce much SMALLER targets on portable stands. At known or unknown distances. The shooter then has X amount of shots or X amount of time to successfully engage them? I'd also like to introduce some paper targets and shoot some 5 or 10 rd matches for score at 300 or 500 yds, or? I look at all that wide open range you guys have and get jealous. Not only being able to shoot, but the views are remarkable. Next week I'll post pics of pine trees and pastures. FN in MT, that's quite the variety of rifle/calibers...I wouldn't know what to do with that Chey-Tac. Always start with a cold bore shot. Maybe a 6" plate at 600yds or 3" at 300yds. 1 MOA, that shouldn't be too hard right? High value point. Know your limits. Set up 5 targets at one berm. 12", 10, 8, 6, 4. Can stop any time. 1 point for the 12", 2 for the 10".....Miss, loose all points. Miss the 1st target you're done. 60 seconds to shoot. Use one of the KYL targets for the cold bore. Set up an easy 5-6" target at 200-300yds way to the left or right. Three other targets increasing in distance going away the opposite direction of the EZ forcing a large swing. EZ, #1, EZ, #2, EZ, #3. Shot this at match, was interesting to see how many rushed/missed the EZ. 60 seconds to shoot. 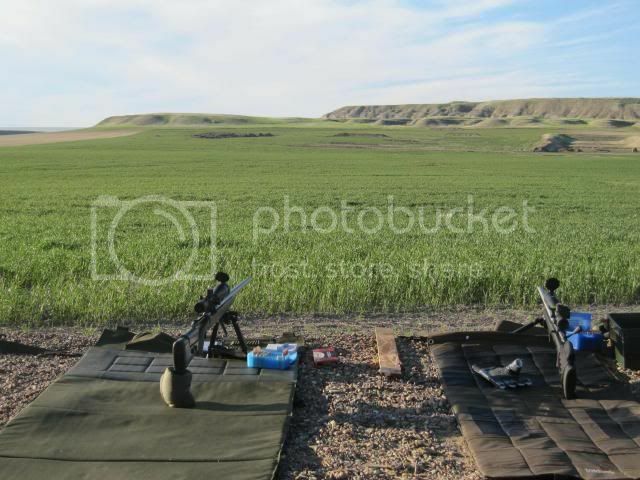 10" target at 300yds, two shots standing, two kneeling, two unsupported prone. 60 seconds. Great hunting practice. 6 targets increasing distance. Start standing, rifle port arms, loaded, bolt open. Go, plop down prone shoot all target in 3 minutes. Single shot guys/BDL's set ammo by shooting position prior to starting. Mix in a no dialing scopes for one of stages, all hold overs. Two shooters 10'-20' away from their rifles. Loaded rifles/bolt open on the ground pointing in the wrong direction/off target a little. Go, who ever gets on the target first advances until you have a single winner. You guys have some nice places to shoot for sure. Loaded up a dummy round finding the lands with the Berger 130 VLD on the 6.5x47 tonight. I like to pull the firing pin and progressively seat deeper method over the Hornady tool. I found true jam at this tension and backed off until there was a slight square mark. Everything now for me will be jam minus something or "in the lands". 9 out of 10 people call it different things but that's what works for me. The OAL ended up at 2.781. How does that compare to others here shooting this combo? Feeds nice through the .308 mag and seems to be plenty enough bearing surface in the neck. That's funny. I have to run the cows and donkeys off to set up steel myself. They can't get to the 1000 yard targets but can any others I put up. Had to stop last time out and drive out the pasture and run them off. Of course I'll take that over FN's rattlesnakes any day. 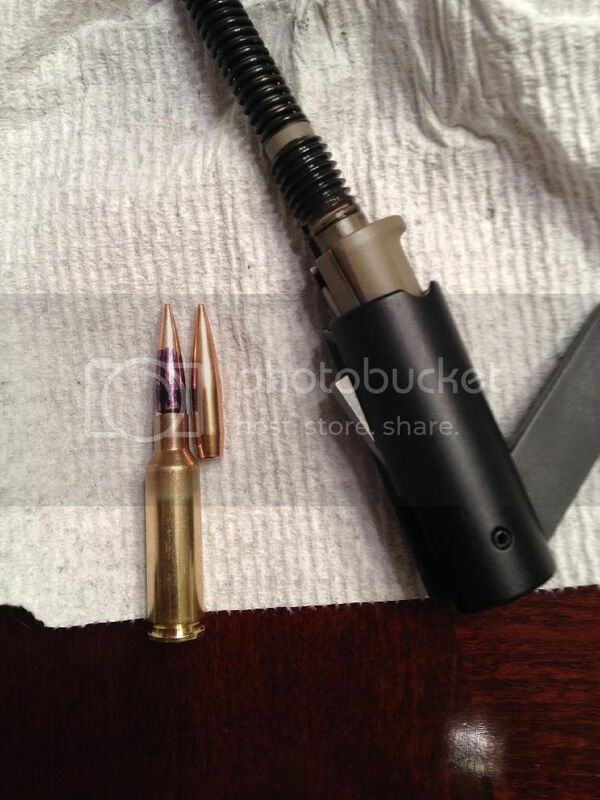 This is the .408 Chey-Tac the day it was finished. A low powered scope...simply running some rds through it and checking it out. It kicks less than most .308's! What a HAMMER on the shorter range steel! Yes the rattlers ARE anissue. We keep the weeds around the shooting area cut and everyone is very "snake aware". Despite all that we still get the occasional surprise like the one a guy almost stepped on alongside the driver side of his pickup! Offgrid....Some great ideas...Thanks. I copied that and threw it in my Range file. 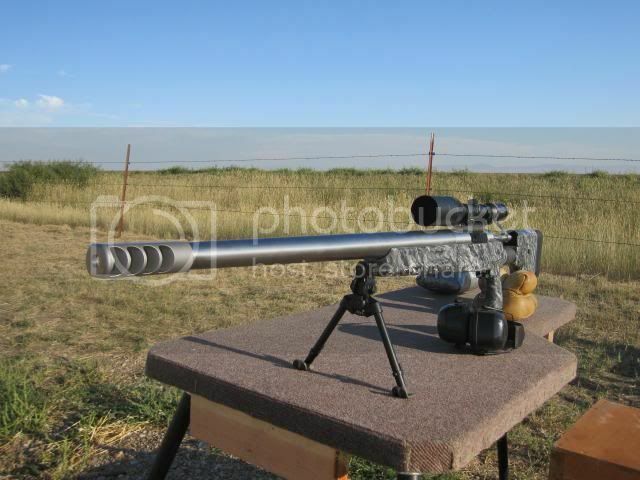 jelrod1, I'll check with my buddies Beanland chambered 6.5x47 for OAL and freebore. You going to do the mystical shoot and clean? FN in MT, very cool you have friend with a Chey-Tac! Would love to take that thing for a spin. Thanks. Just curious how it compares to others. Nah I don't buy into the whole break in thing with barrels like Krieger. I do the "Shoot all I'm going to shoot that day and come home and clean it" method. Has worked fine for my others so I don't see a need to change. I do clean it well before I go though. He's loading the Hunting 130vld's @ 2.78X, .005-010 jam. He uses the same method as you for finding the lands. A few more pictures of where I shoot. Practice at the Sporting Rifle Match in Raton. One of favorite pictures from a match. Thanks. Looks like our freebores are similar. That is some serious hardware on the line in Raton. I bet it's cool to see that many of these rifles in one place. Ya, it's cool to see that many rifles in one spot. The practice range has steel from 300-885. Last year with about 40 shooters on the line a black bear ran across the range at about 600yds. Any of those guys have a Bat tactical action? Anyone handled one? Finally got the first 25 rounds down the tube on the 6.5x47 barrel. I figured from discussion with offgrid here that I would be ending up somewhere around 37.5 of Varget so I tried a couple seating depths there. These 130 VLD hunting bullets seem to be picky at their depth unless I just blew the group at touch. Next up will be checking velocity and a seating depth test at 37.5. I'll seat them long and take the arbor press to the range and try to get the groups as small and as round as possible then stretch it out to 500 thru 1000. Fairly pleased with it at this point. Entropy - all we have mostly is pine trees and pastures around here, too. With 130 Berger VLD's and my chamber cut with a standard PTG reamer I am at 2.770" into the lands. Yours is shooting about twice as well as mine! You have a shooter there! I started out with the 136 gr Scenar-L's and H-4350. Best I could get with limited testing, was about .6"! Disappointing as I have 1K of them. I get 2 or 3 into .2" or .3" then one will blow out 1/2" or so! Maddening. I'll work with the Scenars later. Moved to the 130 Berger VLD's and Varget today. FINALLY a day without WIND. Couldn't have wanted a better day. 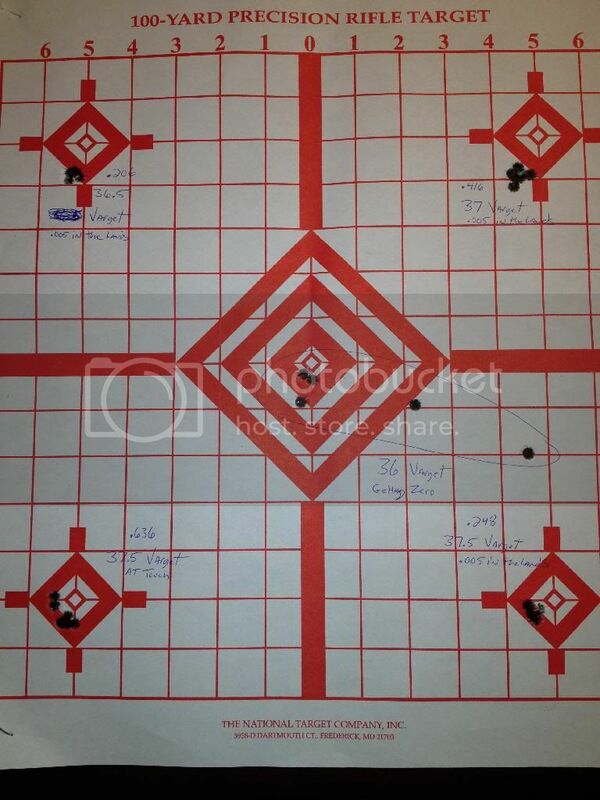 With 37.5 grs VARGET, CCI450, and the 130 gr VLD's I'm getting 2930-2940 fps depending on seating depth. My experience with the VLD's is limited. I can switch between VLD's and standard LR Bergers in my .308 with NO change in seating depth. APPARENTLY not so with this gun. I finally started seating INTO the lands and my groups SHRANK. I had .491" , .453" and .453" all 4 shots at 100. I ended the day with 37.5 of VARGET seated .010" into the lands with a four shot group of .146" so that was a nice way to close the session. Looking forward to another range session like today and I'll try powder charges UP and DOWN a few tenths as well as seating depth in and out a bit. What's that white powdery looking stuff on the ground there? Heck it was over 70 degrees here today. Looks like it needs to be in the lands with this bullet. I'll go back and start at .005 in and work on in till the groups look like I want. I never could get the Scenars to shoot in my 6br. Working the Bergers in the lands has been great though so I'm sticking with them. I'll probably stay with 130's on the 6.5x47. Seems that's just about right with this caliber. Nice shooting. It's cool to see everything come together. The white powder is snow. It was 25° today and it felt like Spring compared to below zero. Are you going to try the 140 Bergers? Once I get a 130 load I'll give the 140's a shot. The 130 gr VLD has a G-7 BC of .282 whereas the 140's are .313 !! Tempting. The 136 gr Scenars were a bit of a disappointment. Though I haven't really wrung them out fully yet to be fair. And haven't tried Varget or RL 15 with them either.